Visit the 610 Stomper store for deals on merchandise! Want a 610 Stomper appearance? Let us check our schedule! 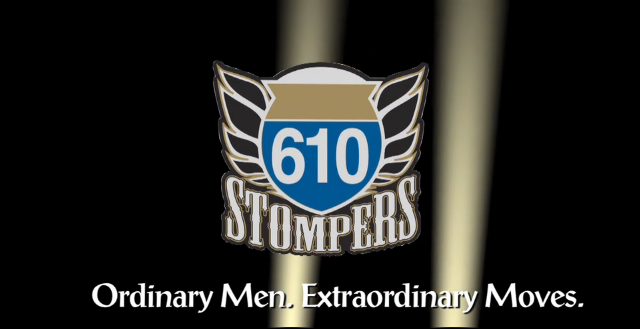 The 610 Stompers are many things but, first and foremost, we are Ordinary Men with Extraordinary Moves. Since our birth in 2009, we have evolved and grown into a 100-man strong, all male dance group whose bold mission is to return the ordinary man to the glory of dance. Men from their 20s to their 80s now proudly call themselves 610 Stompers, drawn from all walks of life and from across the country. While we come from many places, New Orleans is our birthplace and will always be our home. Only here could we create and nurture and grow the singular brand of entertainment we bring to the masses. As diverse as we are, we each share a passion for dance that fires when we see the faces of our fans light up as we dance by. And entertainment is not all our moves bring – the 610 men not only have extraordinary moves, we have extraordinary hearts. Along with our 610 Splits, the strong and beautiful women who protect us, the Stompers have not only performed for more charitable causes than we can count, along the way we’ve raised and donated hundreds of thousands of dollars to those causes. We call it “using our powers for good” and it’s one of the best things about being a 610 Stomper. But while spreading charity is a big part of what we are about, spreading our passion for dance is the true soul of our group and our lasting mission. It’s what keeps us going and growing and dancing into the hearts (and feet) of our fans. We’re coming your way, so get ready to get down with the 610 Stompers. The 610 Splits are the parade of strong, beautiful women devoted to one cause: protecting the men that entertain them – The 610 Stompers. The Splits are the security component of the club, risking their lives on the route, fighting back the endless lines of hot women and wannabe men…throwing themselves at the stompers. We want to thank all of our sponsors and partners for the love and support we've received. It's because of their participation and attendance that we've been able to help numerous charities and non-profit organizations in our community. Click HERE to see a list of charities we've supported. Click the image above to see our video! Be a 610 Stomper for a day! Learn our dances, and dance with us through the streets of New Orleans, as we second-line from bar to bar Mardi Gras style! The Ball Crawl is held every summer, on the Saturday closest to 6/10. Proceeds for this event are donated to charity. Interested in joining the 610 Stompers? Auditions are in August! Sign up for our newsletter for the exact dates. Bring enthusiasm, good nature and take the dancing seriously. Not interested in joining? Come just for the laughs. And you will definitely laugh. A lot. Our biggest party of the year. Join us as we debut our new dances for the Mardi Gras season. It is held in the weeks leading up to Mardi Gras. Like us on Facebook for the party date. Free food from top restaurants, open bar, free beer and wine. All for one low price. Proceeds for this event are donated to charity. Come join us as we bring in the Holidays, 610 Stomper style. We team up with the LPO to bring you a mix of song and dance. This is a show like you have never seen before. You want to see this show. And you will want to see it every year. You will not be disappointed!